The following is from a message that was posted by 'fan2202' on michaeljackson.com and is re-posted here with her permission. We want this message to spread! On October 25TH, we had again the great opportunity to continue Michael’s deepest desire to heal the world. I truly believe, with all my heart, that we can make a difference. There is nothing more powerful in this world than people coming together for a better purpose, even if just for a prayer. It is such an uplifting feeling to know that actually we can DO something for this world .. It is time we get over the differences of color, race, upbringing, and we start looking for that which we all have in common, that capacity to love and care for the others. Giving is part of our healing process…SO LET’S START GIVING..
- If possible, consider sitting back and relaxing a couple of minutes before the start time, just to calm your mind. Take some deep breaths and let any worries fade away. You may choose to listen to calming or inspiring music that reminds you of why we're joining together for this event. - Close your eyes and tune into Michael's love for us..
- Focus on your heart and how this love feels inside..
- Imagine/visualize all the other people who will do this prayer at the same time. - Imagine/visualize that the love we all feel spreads to the entire planet, going through all living forms, healing us all.. It's the most noble idea i've ever come across. I'll try my level best to be a part of this event on monthly basis. I love your comment, Marta. Thank you to everyone who is joining us for this :) Please spread the word on MJ fan forums, youtube, Facebook, Twitter, etc so we can have the biggest impact possible. And remember this is going to EVERY MONTH, so our next prayer after NOV 25 will be CHRISTMAS DAY (Dec 25). I already feel blessed to have been invited...Thank you! hi all across the eart, I was looking Michael Jackson's film This Is it.ia full movie lounge. He was more than you can imagine candnes, cheek, he was so wonderful collaboration with his colleagues, dancer singer. He delivered, all from the self. He shows signs with words and deeds, how he Wished they would do and. When He well-told, he said, always the words with all the love. Please be careful. Do not look at Michael as a God. Remember God loves Michael and us. So we should focus on God's love for us. I don't believe anyone here said Michael is God. He's someone who's inspired us. We choose to use that inspiration to do good in the world. Perhaps I should clarify something. I suppose some of the wording in the original forum post that's copied here is what caused the concern, but rest assured we're not saying MJ is a deity. However, he was/is a great uniter, bringing people together from all over the world of all different races, ethnicities and religions. And he has left us with Heal the World, Earth Song, We Are the World and so much other beautiful music and speeches that continually remind us that we can make a change and that it's up to us to take care of each other and the planet. He was a kind human being who spoke of love, forgiveness and caring (and also had a deep belief in God, btw) and that's what we're trying to do; to carry on his legacy by doing our part to heal the world. This monthly "prayer" is one way in which we might make a change. We do this in his honor as fans, yes, but also because it's the right thing to do. Inspiration is the perfect word. Hope that makes more sense. We've started a Circle of Love for Michael at MJFanClub.net under the "Help Each Other in these difficult times" thread. under "For the Spiritually Minded". We do this everyday. 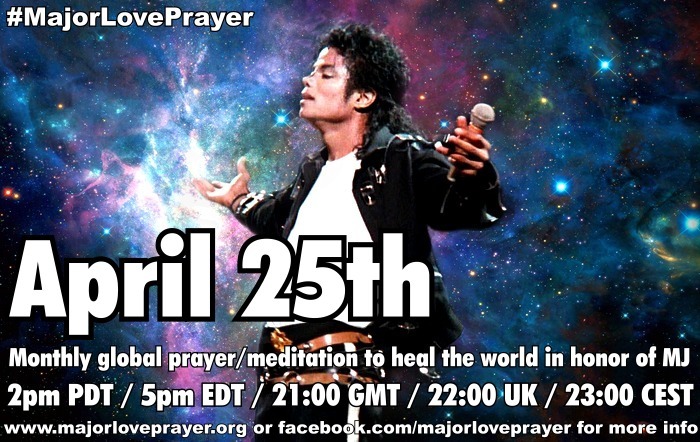 and we are looking forward to joining with everyone around the world to Pray for Michael's intention of Healing the World! God Bless you Michael and your precious children! Traduccion es español seria muy bueno para seguir transmitiendo el mensaje. I will join the world today in prayer not only in Michael's memory, but also to thank God for Michael and for bringing us together all over the world. Funny as I type this, Will you be there just came up on itunes! For the people in the states, have a blessed Thanksgiving tomorrow with your loved ones and hold them close. Hi, I'm from Russia. I will pray tonight for Michael with all of you, I feel like I'm a PART of something HUGE and STRONG. My prayers will be to God in the name of Jesus Christ (whom Michael believed in and served, not to a vague spirit being) to turn our hearts towards helping others just as Michael did. To give us the opportunity and and means to be able to reach out to those in need. 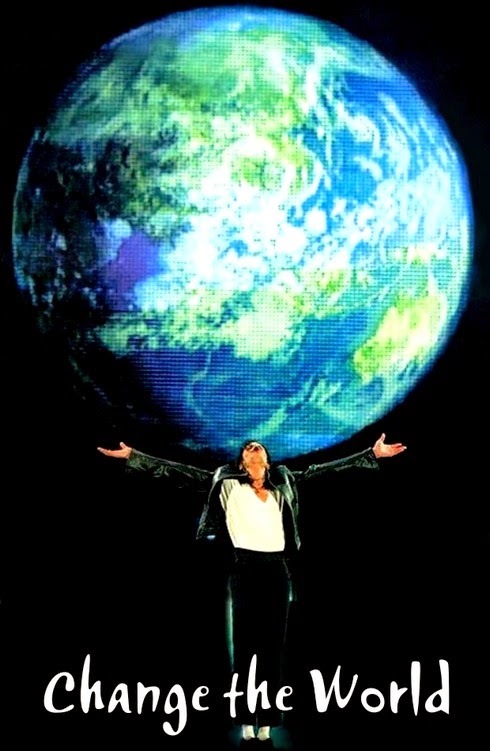 As we pray to Heal the World, I'm reminded of the video for CRY, hands held around the world. That's wonderful, thank you :) Since they are people of all different religions and beliefs participating, that wasn't specified in the post. I hope that everyone will do it in their own way, either religious, non-denominational or even just with the idea of conscious energy ... whatever you feel and believe in. Thanks for sharing! Thank you for your beautiful action very much! I must say first that I consider this the most beautiful idea I have ever heard! I must say second that I consider Michael Jackson my kindred spirit and soul mate. I must say third that I missed a chance to meet him and that was the worlds biggest mistake. Last of all, I must say that when I see his face I feel like he is family or something like that. His words, thoughts and feelings parallel that of my own and I am sooooo glad he said them. Lastly, I want to add that we ALL NEED TO PRAY FOR JUSTICE IN HIS CASE since it does not seem like he should be gone, not to me. dear michael, you are in my heart forever. I love you all. Thank you for taking Michael's message and using it to create such a wonderful movement. thx 4 all the beautiful memories u gave us,thx 4 being with us,thx 4 gathering us from all over the world with ur luv. we luv u so much,we miss u so much. may Allah be with u always Mike,coz u were such a 4giving ,luving,caring,peaceful & great heart human being. i cant hold my tears & am not regret 2 each tear drop goes 4 u dear. luv u more & more each passing day. Thank you all! These were one of the most blessing minutes i've ever had in my life. I felt the connection between everyone who was praying with me. Just like a family. This is incredible! This love is just simply larger than anything else in life. And thank you, Michael for bringing this love into my life. You gave a reason to live, an aim to fight for. You couln't have done more for me. I love you with the deepest respect and love i just can offer. I Turned off the lights tv etc. lite a candle played Another Part of Me & Cry and prayed to the world..
thank you...wonderful- may gratitude & sharing in Michael's love endure. Until next time, I hope everyone takes the opportunity to share, in love. We need to continue taking action to stand up for the true integrity of Michael. Spread the awareness of factual bio info. and his genuine humanitarian efforts. Michael your smile will be forever in my heart! You are not alone...I love you, we love you! Thank you allah for making us know such a great person like michael.... it was a great prayer. I pray it alone with my own way, but I felt that my soul was connected to michael and to all the people all the world who gathered to pray for such a wonderful reason. and i felt Michael's presence with me when i was praying alone to allah. i felt he was very happy to know that we are doing this and as some of you explained i saw his beautiful smile too. May allah bless him and rest him in peace.... i STILL shocked THAT HE IS GONE AND THIS IS REALLY REALLY HURTNG ME REALLY FROM THE BOTTOM OF MY HEART. I was very satisfied to know that my sprits was connected to all of you people. you are all such a great people and its a great idea. MAY ALLAH BLESS YOU ALL and bless the one who did this great idea that will really make michael very happy. and thank u for all for what've u said cuz i really really had the same feeling about mj the way u explained guyz... that means we are really connected in souls and we had the same great feeling for michael. I love you michael jackson very much. very very so much.... AND i love you all. Was it always meant to be this way? That we would only understand something brilliant, something beautiful, had sat at our table, walked with us to school, danced with us when no-one else would, been there all the time - when it no longer was. Into the space he occupied, into the vacuum, somehow has flowed all the love in the world. Michael has changed my life, he is the point of light in my heart. I prayed for peace, love and healing - and that the truth of his integrity and innocence would be known and understood by all on the planet - in our lifetime. I will honour, respect and love him and forever. Thank you for doing this. I missed it today; however, I will make every effort to participate on a monthly basis going forward. I think this is a wonderful idea and will keep us close with Michael spirit. Peace and Love. ‘Cause you knew how to love and do your best!!! When I penciled in my candle time with Michael and you all the other day, I had no idea I would light the candle for my father the same day. It hasn’t sunk in yet that I have no daddy no more, but I wanted to write this poem for my dad, Michael, you all... and for myself. I’m learning how to love so big that it transcends all sorrow, and I want to contribute this to the world. My dad wasn’t perfect; Michael’s dad kicked him in his groin... I too am not perfect, but I know now that I have can try to be my best... My love to all of you and may we pick ourselves up, after our losses, to heal the world... because if we don’t, who will? i felt the love the good the bright side of the world & what it should be i'm sure that we can change & heal the world i feel like i'm a new person & i like what i see in the merror so thank you Michael i will love & respect you forever may Allah bless him . i'm sure he's smiling proud of us & i really believe in us. From Sri Lanka. The memory of Michael will live forever. We thank God for sending him to give us the message of love and peace. Prayers were said at 3.00 a.m. on the 26th. Thanks for starting this major love prayer. It helps to bring his fans together. I am honored to be a part of this PRAYER group. And I am glad it's my first on Christmas Day. What a wonderful idea and what a generous thought to continue Michael Jackson's legacy ! God Bless you all for joining us in this most wonderful adventure of creating the healing of our world.....Begun by Michael's love and heart, continued by the millions who love and honor him. He was a king among all who are here. Someday, I pray that all will see just how lovely Michael was. On November 25th I forgot it was world prayer time, but it happened I was out walking and visualising anyway, all the hearts in the world aglow with love for Michael, as lights glowing across the globe. It was very heart warming and beautiful. then I came in, went to youtube, where moments earlier a friend has sent an email reminding me of this event. It said ; a moment of silnce for Michael" I stopped in wonder, closed my eyes and felt my world turn to silence. Then a wonderful thing happened; love poured over me, through me, and i was in an endless ocean of bliss, transcending all thought and emotion. THANK YOU everyone here for the most powerful spiritual experience of prayer. Thank you Michael for bringing us all together, and thank you God for bringing us Michael. I didn't find out about this until yesterday. Even that was pure luck. Obviously I couldn't participate in November's prayer (my own word choice), but I'll do my very best to participate this month. BTW, anyone who is interested in working to vindicate Michael's legacy, not as a pop star, but just as a good man, please visit my Facebook group; VindicateMJNow. Thanks.